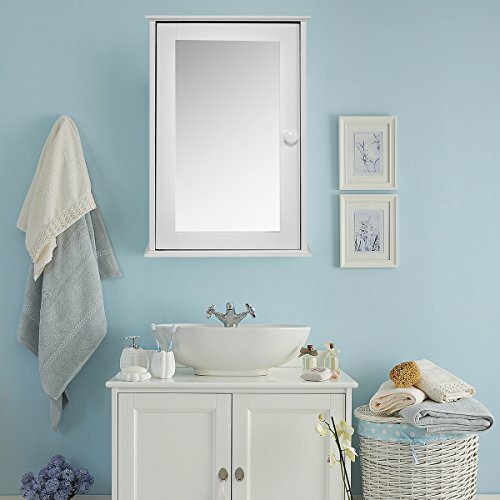 Tangkula Bathroom Cabinet Single Mirror Door Wall Mount Storage Wood Shelf comes with MDF Board and mirrors. The bathroom cabinet is wall mounted one, it doesn't take up your place. The design of the bathroom cabinet is reversible for left- or right-hand opening. There is one adjustable wood shelf, which will hold all your toiletries and bath items. The cabinet keeps your bathroom tidy and clean, also keeps your daily items dry. The cabinet comes with a sleek mirrored surface inside and outside. The door of cabinet can be opened with 180-degree, which you can easily access. Once you install this practical cabinet, it will bring you more easily life. Buy one! Welcome! All necessary hardware and tools are included in the package. And there is only one box. We chose best boxes and packed as good as we can. But if there is any part missing or damaged in transit, plz feel free to contact with us, we will reship it to you at no any charge to you. Experienced Customer service team will quickly solve any doubt for you with patience and smile in 24 hours. Welcome! 【Elegant & Modern】An elegant construction and finish, our bathroom cabinet is perfect for any bathroom to storage your cosmetics, toiletries, cleaning products, and other bathroom accessories. 【Functional Design】Equipped with mirrored door, you can make up in front of the cabinet and check your appearance before going out for work or date conveniently. 【Space Saving】This wall mounted bathroom cabinet can help you save much space with compact design, and you can put the thing you need on the 2 shelves rather than leave them everywhere. 【Easy to Clean】This side table is made of mirror and MDF, which makes it easy to clean with damp cloth.